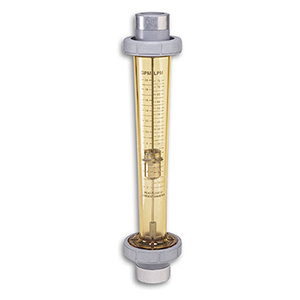 FL45100 Series flowmeters feature a rugged, one-piece meter body of heat- and chemical-resistant injection-molded polysulfone. A precision-textured light-admitting surface at the rear of the meter body diffuses ambient light and creates a softly illuminated background to enhance readability. These meters are not recommended for applications involving direct sunlight. Additional features include a stainless steel float guide and float, 1 FPT polysulfone adaptors, and FKM O-ring seals. For harsh applications, units may be ordered with Hastelloy C float guide and float of either Hastelloy or TFE (depending on flow range). Models are also available with 90° adaptors and 1 MNPT connections for panel mount installations. For Hastelloy C float material for harsh environments, add suffix "-HL" to model number, add $275 to price. For optional 5-point NIST calibration, add suffix "-NIST" to the model number, add $375 to price and two weeks to the delivery.